They might just look like a sea of green but there are a lot of different weeds in this patch. There’s couch grass, other grasses, buttercup, thistle, dock and nettles. 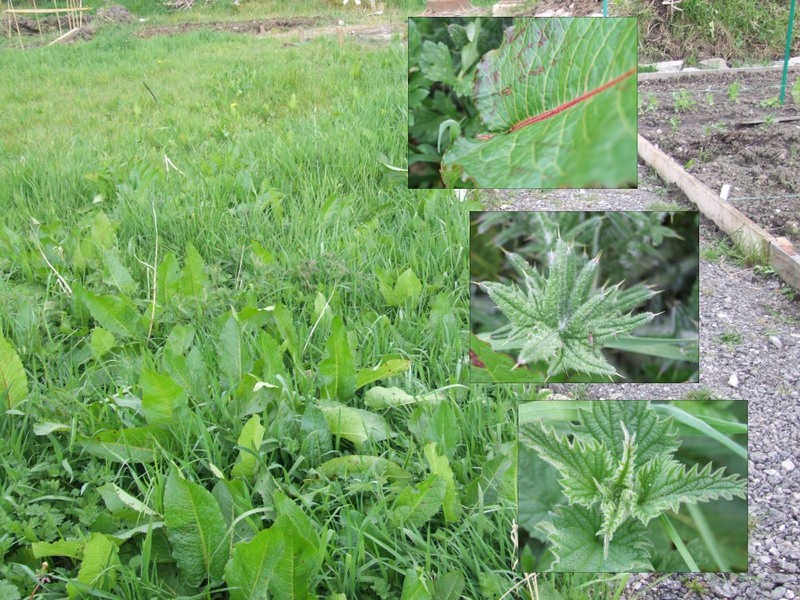 Inset photos are dock, thistle and nettle. How do you tackle a plot like this? I’d start by strimming it all down as close to the ground as possible. You can then dig the ground over and remove the roots. Put all the cuttings and roots in a big pile, cover and leave to rot down. You could try lazy bed gardening where you mark out a bed and then fold the outer thirds on top of the inner thirds. This creates a raised bed. In theory the weeds die as they’re no longer exposed to the sun. You can fill the middle with muck before you turn over the edges. 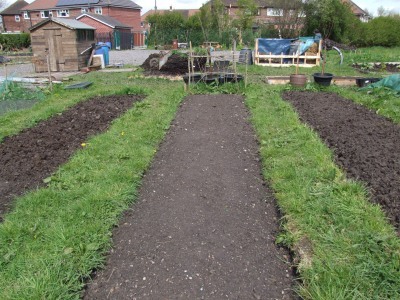 This sort of bed is easier than digging all the weeds out and can be mulched with grass clippings over the next few months to help ensure the weeds don’t come back. Plant potatoes in it as they’re good for starting off with. Another approach would be to weedkill the patch and then dig it over. You could also weedkill the bed and then cover it with weed suppressant materials like newspaper and mulch over and plant through the layers. Each gardener will have their own method of attack. Some will start quietly in a corner and keep going until they have turned it allover. Some will frenetically bounce around the plot until it’s a maze of half dug patches. As long as you keep attacking it you’ll win the battle, or at least appear to be. An untended plot means weeds get chance to go to seed and spread. This is bad for other allotments and needs to be dealt with. At least you know if weeds are growing then the soil is reasonably ok. The lush growth on this plot tells me it’s pretty fertile. Also nettles are supposed to indicate fertile rich soil. It’s always nice when you start to spot the plants coming up. Here’s a photo of a raised bed. It’s filled with soil from underneath some trees on the plot. 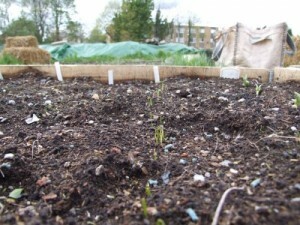 The bed has leek (white giant), celery, celeriac, spring onion, leek (jolant) and broad beans in. I’ve never grown in raised beds before but thought I’d give it a whirl! Probably a good job as the ‘drought’ we’re experiencing has ‘droughted’ us another couple of inches of rain in the last week. My spuds are coming up too! Earlies and maincrops! 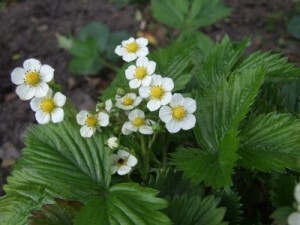 We’ve got a communal strawberry bed that has plenty of flowers now! We can’t be long off strawberry season! The bed has just been weeded by someone – so it could well be a good time to put some straw mulch round them – it’ll help keep the weeds down in future too! Just had a walk round the allotment site. It’s a lot calmer now and it’s been sunny. My wheelbarrow had fallen over but that was it on my plot. The wind hasn’t done as much damage as the slugs. 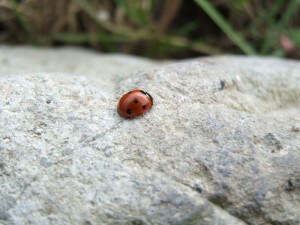 There’s not a lot going on – but I did spot several ladybirds on my compost heap. There’s plenty of places to hide on my allotment plot – I have one enormous heap of compost and a compost bin too. Sadly it’s not a very exciting bit of video – just shows a magpie swooping about and then the wind blowing at tarps covering weeds and compost heaps. My partner Nic told me it’s the most boring video he’s ever seen – so you have been warned! The main damage has been someone’s shed roof felting has partially come off. Their plastic greenhouse has also broken itself. It survived the wind the other day after blowing over so they tied it to the shed, sadly this just meant it mangled itself about as the wind ripped round it. A compost bin blew about and was put safely at the edge of the site so it didn’t damage anyone’s plot. Lots of weed cover fabric came undone too – it seems the wind was powerful enough to keep at it until it got under and once it gets under a bit it makes it easier to rip away. What’s growing on your local allotments? On a TV gardening program recently they showed someone who had an allotment who only grew euphorbia on it. To my mind this is wrong. An allotment is for the growing of vegetables to feed your family. Yes, by all means have some flowers, they’re good companion plants in many cases and help encourage bees and other beneficial insects to your plot. But dedicating a whole plot to a plant you can’t eat sounds wrong to me. It’s against the very spirit of allotmenting. This led to a discussion with friends about how many plots people have. The majority of people have one plot, but on a nearby plot a family has two plots – the husband and wife have a plot each. This came about because of a lack of people on the waiting list – rather than leave plots to go to rack and ruin there are a couple of couples on a nearby plot who have a plot each. Whilst it seems immoral when that sites waiting list is so huge, what’s the answer? Do you throw people off a plot that they have been growing on for years? If they were growing lots of non-edibles, or growing things that they gave away then that would be wrong. It would be unfair for those people on the waiting list to not have a plot whilst someone had one that they used for ‘non-traditional allotmenting’. I’ve been told about one man who has several plots and uses one for just growing pumpkins on. He gives them away. This strikes me as very strange! Why should he be allowed to have an extra plot that he doesn’t eat anything off? The 1922 Allotment act definition of an allotment garden is “an area not exceeding 40 pole used wholly or mainly for the cultivation of vegetable or fruit crops for consumption by the occupier or his family”. This is a fair definition for me. Why would you use an allotment as anything else? If you want to grow flowers then grow a few, but not a whole plot worth. Some sites set percentages that may be used for non-vegetable growing – and this excludes any wild flower meadow that people might try to claim they grow. There are some people who keep racing pigeons on their allotment – and that’s all they do. If you drive past allotments that look like shed-shanty towns then the chances are there’s some pigeons in there somewhere. I’ve read too about people having cooking facilities, running water and even beds in their allotment sheds. At what point do you draw the line? If there were no waiting lists for allotments then the issue would be one of solely the land being used for growing something. When waiting lists are so high and full of people wanting to actually grow food then I think the plot-hoggers need sorting out. How can action be taken without the clamp down being portrayed as mean in the press though? Perhaps there is a need for a campaign of ‘allotments are for growing food’ perhaps – to highlight the problems of waiting lists and those who do other things on their allotments. Packs include a Chili Pepper Collection which offers you three types of chili. Lots and lots of different tomatoes too so you can try different types. 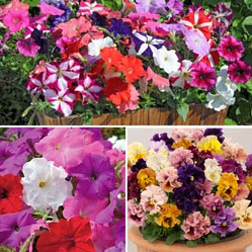 Fill your beds and borders with this lovely selection of pansies and petunias. Collection comprises: Petunia ‘Bedding’ Mix – A beautiful range of petunias that will add some striking colour to your garden. Petunia ‘Frenzy’ Mixed – An interesting blend of over 20 different types of petunias. Perfect for a long lasting display your containers, beds and borders. Pansy ‘Ballerina’ Mixed – Unusual frilly tutu-like flowers of ‘Ballerina’ will create a bright carnival of colour throughout the summer. The delicately ruffled petals will make a stunning display. Petunia ‘Bedding’ Mix – A beautiful range of petunias that will add some striking colour to your garden. Petunia ‘Frenzy’ Mixed – An interesting blend of over 20 different types of petunias. Perfect for a long lasting display your containers, beds and borders. Pansy ‘Ballerina’ Mixed – Unusual frilly tutu-like flowers of ‘Ballerina’ will create a bright carnival of colour throughout the summer. The delicately ruffled petals will make a stunning display. They sell Comfrey Pellets which are highly recommended by lots of gardeners! Did you know that different plants have different needs? seven micronutrients: boron (B), chlorine (Cl), copper (Cu), iron (Fe), manganese (Mn), molybdenum (Mo), and zinc (Zn). That’s not all plants need to grow – they need carbon, hydrogen, and oxygen. This is provided by water and carbon dioxide which plants use in photosynthesis. They also need sun but you can’t buy that in a bottle – yet! You can buy organic fertilisers like chicken manure pellets, use well rotted farmyard manure, or comfrey, or you can buy inorganic or commercial prepared fertilizers. These fertilizers offer no bulk material. You should buy what you’re happy with. Many people are happy using growmore on their crops, or just can’t get hold of bulky manures to use. Chicken manure pellets are commonly found for sale in supermarkets these days – in large tubs and are quite inexpensive. It is 12-6-7 NPK ratio. Club Root resistant crops are something most of us will be interested in. 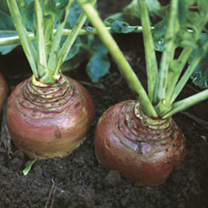 This Club Root resistant swede is well worth a look if you’d like to grow swede. This is a strong-growing, Club Root resistant swede. Winter hardy. Also has Powdery Mildew resistance. Culture: To avoid foliage mildew sow early May in North and late May in South (20-24 weeks maturity). HEALTH BENEFITS: Good source of vitamin C, Calcium, Potassium and Magnesium. Cooking – peel and chop into chunks into stew, or boil and mash with carrots for a lovely side dish. Delicious with haggis and red cabbage.